For school districts having more than a few schools, we highly encourage the use of imports whenever possible. Importing saves time and eliminates data entry mistakes. Our customers also commonly find errors in the source systems, such as invalid cost center codes or invalid function or object codes, through the error checking and error reporting mechanisms built into all of our import modules. Generic Text-Based or Spreadsheet - These imports can work with any comma-separated text file or Microsoft Excel spreadsheet that contains the necesary data elements. Direct Connection (Vendor Format) - These imports are designed to interface with specific software vendors and products. In cases where the datasource is a SQL Server database, a SQL Server login with read-only access to the datasource is required for implementation. You may provide this document to your database administrator or system administrator to start that process. Direct Connection (Generic) - These imports can be configured to connect to any standard database format such as Microsoft Access, SQL Server, MySQL, DB2, and many more. The obviouse advantage to using the Direct Connection import is the elimination of creating and posting text files. The Direct Connection imports allow for user-defined pre-import operations, custom query definition, and post-import operations to be defined making them extremely flexible and easy to setup and maintain. Queries and other operations may be tested independently and query results may be viewed and exported. Once the setup and configuration is complete, users simply click a button. 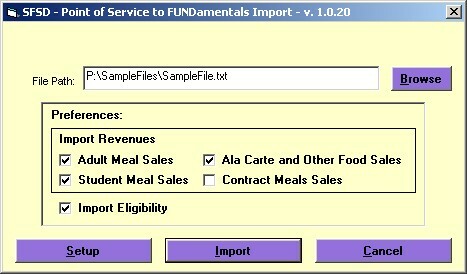 The field positions for generic imports are completely user-defined and data elements may be the result of a computation on two or more fields. The Meal Counts and Labor Hours imports have the optional ability to import revenues and/or expenditures. All imports create monthly summaries by cost center. All imports provide full error checking and error reporting before the actual import takes place. The user may print the error list and cancel the import in the event that errors were detected. Other custom imports may be purchased based on a small hourly rate. If the vendor and product used in your district are not on the list above, please let us know by calling Visual Solutions at (888) 228-3120. In order to give you an idea of the data elements needed for each import, the following screen shots have been provided. Please refer to the FUNDamentals Financial Import File Specifications Document for detailed information on import file specifications. Please note the data elements in the Field Positions section. The Special Code is an optional means of identifying a particular revenue or expenditure where code combinations are used. The import accepts a wide variety of date formats. Please note that the expression in the Expense Code box is a range of expense codes. The import also accepts single codes or multiple single codes separated by commas. The expression may even be a combination of single codes and ranges, for example, 610-629, 632, 635-640. Revenue and Expenditure Sub Categories are user-defined and may be added or edited to conform to the local accounting codes. It is common practice to prepend sub account descriptions with the associated function or object code. Also, note that a revenue or expense category or sub category may be excluded from the import. This may need to be done when these revenues or expenditures are being captured from another source, for example, Student Meals Sales or Federal Reimbursements. It may be preferable to capture these from a Point of Service export, or by generating the revenue based on meal counts obtained through a Point of Service export. The Direct Connection Financial Import shares the previous screens with the generic import. Datasource configuration and operations are managed by two additional screens. 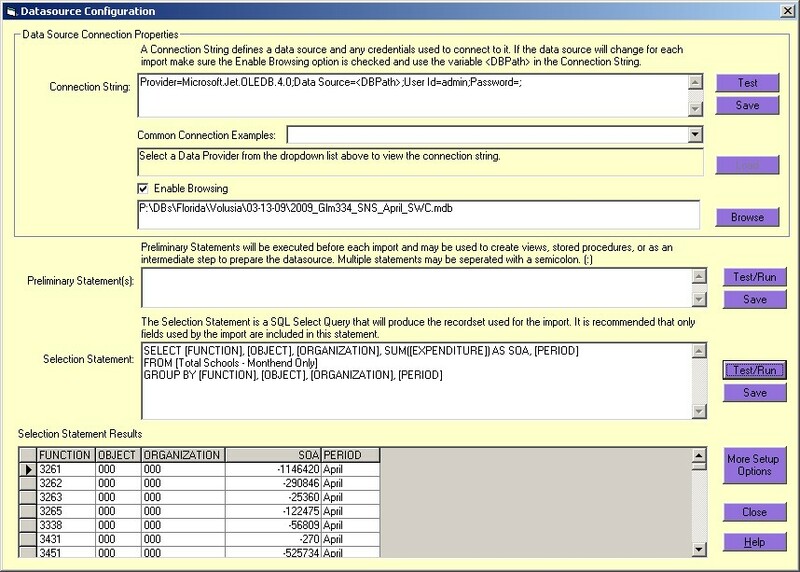 This screen allows for a user defined connection to be established for any available type of datasource. Common datasource connections for Microsoft Access and SQL Server are available as examples to help you get started. In the event that financial data is available in monthly databases, users may browse to the appropriate file before importing. (The variable <DBPath> will be substituted at runtime or for testing for the database file selected by the user) Preliminary Statements may include stored procedures or valid SQL statements that may be needed to create temporary tables, or to prepare the data for the Selection statement. The Selection Statement is the SQL Select query that will create the recordset used for importing. The field positions must match the field positions identified in the Import File Layout Screen. Once a connection has been established to an existing datasource, the preliminary and selection statements may be executed or tested. Testing the Selection Statement will populate the grid so that the results may be viewed and verified. This screen provides even more flexibility to massage the data before the Selection Statement is executed as well as to perform any other necessary operations after the import has completed. A common use for this function is when two or more source cost centers need to be combined. Please refer to the Point of Service Export File Guidelines Document for detailed information on export/import file specifications. This screen shows the available import options and preferences for the Point of Service Import Module. 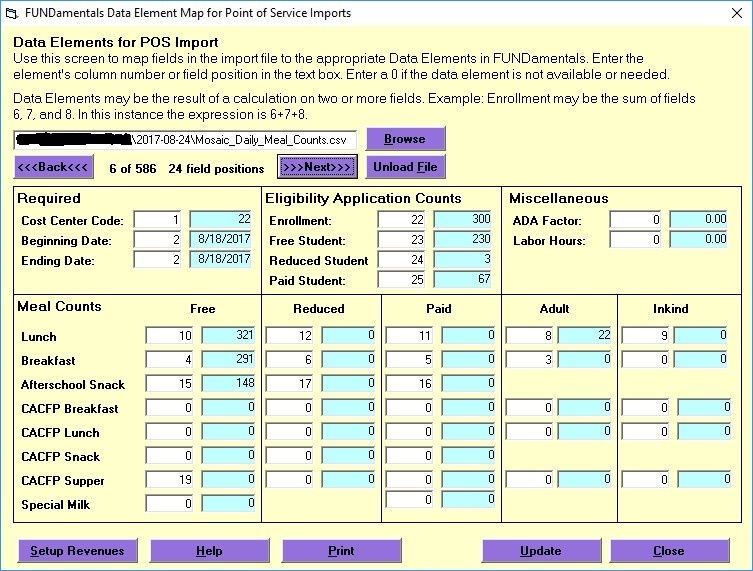 This screen shows available data entry elements for this import. A 0 means that the data element does not have a source and will not be imported. This example shows a useful feature of this import that allows the user to view the elements by actually loading a file and displaying the information as defined by the map. 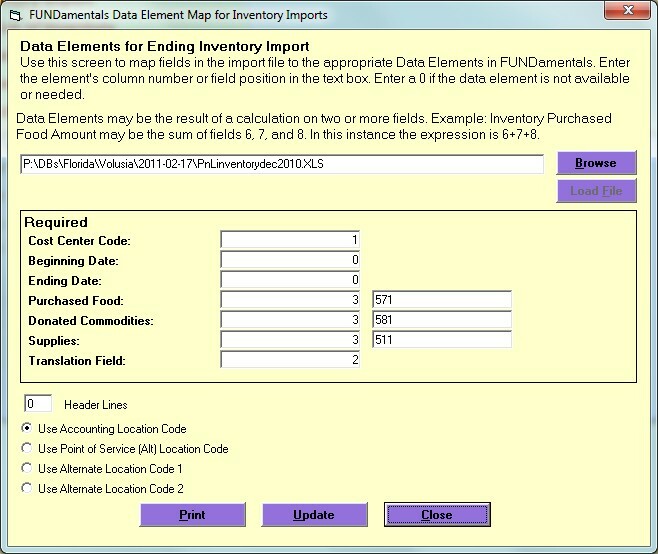 This screen is used to map field positions in the import file to optional revenues. 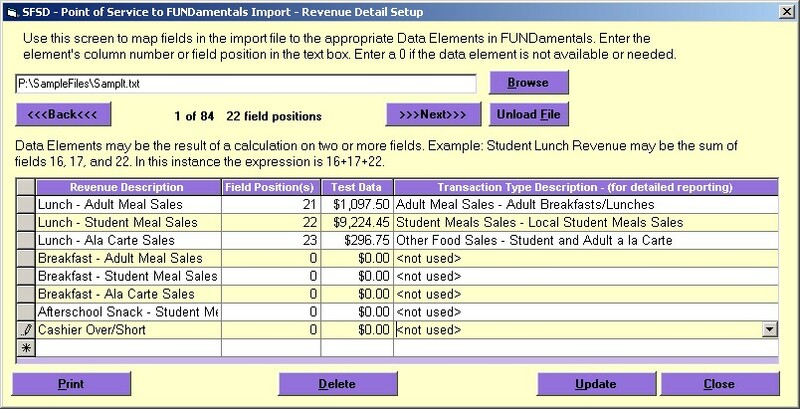 The revenue categories may be user defined and added or deleted as needed. Again, please note that the file has been loaded, and sample data is available for easy setup and troubleshooting. Date column(s) are optional. When both date fields are set to 0, the user will select the appropriate month when importing. 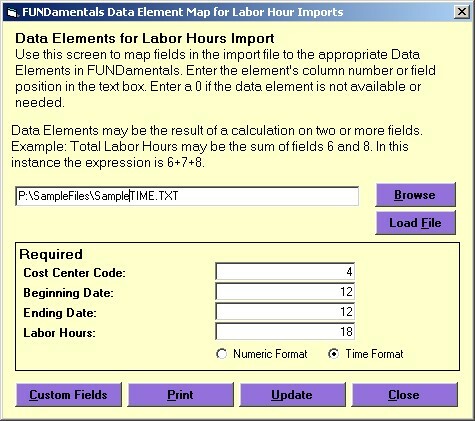 This screen allows the user to define custom fields for import into the FUNDamentals program. The custom fields may be revenues or expenditures and may be mapped to any revenue or expenditure subcategory.